Scroll down to see our selection of food and liquid scales for sale. Food and liquid scales are used by individuals with special dietary needs. We carry a large selection of food and liquid scales for sale including ultra thin liquid scales, volume measurement scales, digital nutrition scales and primo digital food scales. What is a food and liquid scale? Food and liquid scales are kitchen devices used to accurately record the weight of ingredients. Volume food and liquid scales are particularly important for consistent baking results and for estimating cook times. Nutrition food and liquid scales can measure out precise nutritional information like calories, carbohydrates and fats. Most food and liquid scales are small and come in variety of colors to match your home or office. 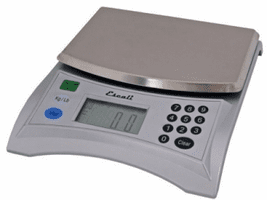 Escali Mercado, Stainless Dial Scale with Bowl, 11 Lb / 5 Kg.